Stinging nettles are something I like to eat in the spring. You may have heard me mention it before, but I find I start craving them when they are young and fresh, especially after we’ve been through a long dark winter and are in need of reviving. They are a good spring tonic full of vitamins and minerals and not only that, they taste good too. When I pick them for making soups, frying them up with potatoes or using them as a general spinach substitute, I pick the top four leaves of the young plants only. Older plants and other leaves can be a bit too fibrous, making them unpleasant to eat. However, for drying and making nettle powder, I wanted large leaves as these are easier to cut and less are needed. I took a basket and my precious kitchen scissors down to our plot where I knew there were plenty of clean green nettles. Snipping off the leaves wasn’t quite as easy as I’d envisaged, but I didn’t get stung too often and it was easier than wearing gloves. I laid the leaves out on my Optimum P200 dehydrator trays using a pair of tweezers, which worked quite well. When dried, I found I could pick up the leaves bare handed without getting stung, but I did handle them fairly gently. I spaced them out slightly apart so the air could circulate, but tried to get as many onto each tray as I could. You can see the before, during and after process of making my green nettle powder in my dehydrator review post. The first time I tried, it was a bit hit and miss as to timings, but I set the dehydrator to 35℃ and in the end it took seven hours. The experiment was an outstanding success. The nettles dried quite quickly, retained their greeness and my Optimim 9200A power blender made short work of turning them into a fine green powder. Once I knew it worked, I was off down the plot collecting more nettle leaves. I found 5 trays gave me 50g or 24 tsp of powder, a respectable amount I reckon. No sooner had I made the nettle powder, than a smoothie was in order. To celebrate the occasion, I made a smoothie bowl. This allowed me to savour the concoction rather than gulp it down. The nettle powder in the quantity I added it, gave a subtle nettle taste rather than an overpowering one. But I’m sure it did me no end of good. A breakfast bowl of delicious and nutritious kefir, nettles and other ingredients to set you up for the day. 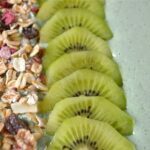 Blitz everything together, except the muesli and kiwi fruit, in a high speed blender for 20-30 seconds. You may need longer in an ordinary blender. Scatter ½ tbsp of muesli on top of the smoothie along one side of each bowl. Halve the kiwi fruit slices and arrange along the centre of the bowls. You can omit the muesli and kiwi fruit and drink this from a glass. The smoothie gets even better kept in the fridge for 24 hrs or so and acquires quite a fizz. Thanks for visiting Tin and Thyme. 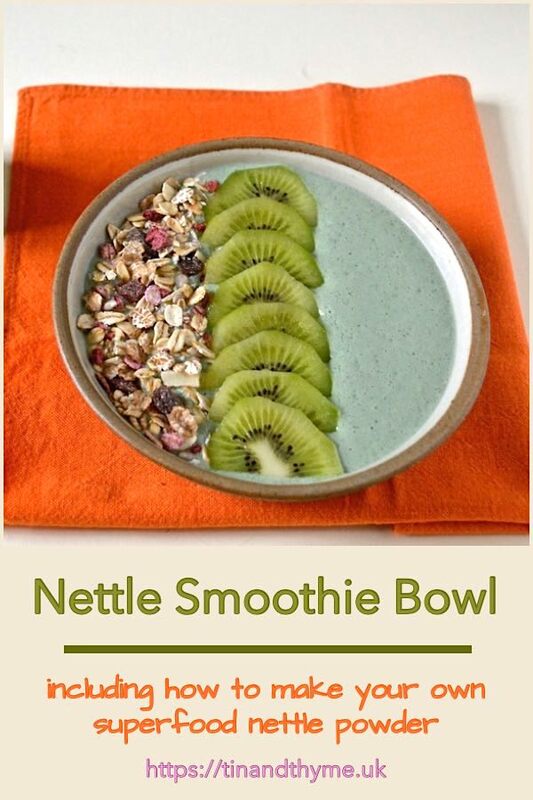 If you make this nettle smoothie bowl, I’d love to hear about it in the comments below or via social media. Do share photos on your preferred social media site and use the hashtag #tinandthyme, so I can spot them. For more delicious and nutritious recipes, follow me on Twitter, Facebook, Instagram or Pinterest. 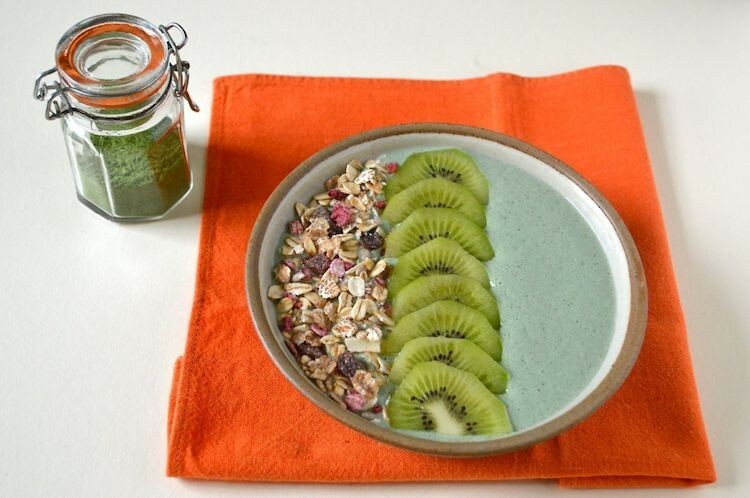 Nettle Smoothie Bowl. PIN IT. I’ve had nettle tea once but I love the idea of drying the leaves and making them into a powder. A great way to get added nutrients in a smoothie! I keep meaning to try some of this as tea, in the same way you’d drink matcha, then keep forgetting! It is a lovely colour and I’m really pleased with it Johanna. You must have some useful healthful green weeds you could use. I’m wondering about dandelions, but think they might be a bit too bitter. That looks amazing! I thought you had bought the powder but the fact you made it yourself boggles my mind. Now coveting a dehydrator for sure. Nettles are one of the most delicious wild weeds IMHO and with incredible edibles in Bristol, you must be able to find some. What an absolutely fantastic idea, love the idea of making a powder from nettles, a great way of preserving the crop for use at other times of the year and to be able to use it in more ways. So clever! Great idea for the dehydrator, we are awash with nettles already, so I may be drying some myself! This smoothie bowl is full of wonderful healthy ingredients. It looks awesome too. Thanks Nayna. We have a lot of smoothies, but rarely have them in a bowl. It makes a nice change. Gosh, what a BRILLIANT idea! This never occurred to me! I shall have to don my gloves and head out for a forage – very brave of you going without, I can’t stand being stung! It’s a hazard of living in the countryside Chris and something I had to get used to at a very early age, but it’s not very pleasant. I wear gloves when picking nettles, unlike CT who does it bare handed, but as I was snipping with scissors, I thought I’d be OK! What a brilliant idea! I went on a foraging walk once and the guide told us how nutritious nettle seeds were. I love your green powder. I’m going to make some for my cafe menu!! Your nettle powder was such a good idea Choclette and a really nutritious addition to smoothies. Excellent!!! I’m intrigued by your dried orange powder, is this one you made yourself? I was going to try doing it myself now I’ve got the dehydrator, but this lot was done by my mother. She dries the peel on the back of the aga and then blitzes it. I use it in smoothies, in bakes and sprinkled on muesli. I can totally see myself starting the day off with this delicious smoothie, Choclette! Thanks Agness. At this time of year I can get my nettles fresh, but for most of the year the powder is really useful. Thi s is such a clever way to use nettles. I need to get my dehydrator on the go and dry some nettles. Thanks Janice. I love my nettle powder and use it a lot in smoothies.